With proper planning, manure management can be beneficial to both the farm and the environment. This article provides information on environmental and health impacts of manure as well as proper manure storage and management. Manure management is a vital part of modern day horse ownership. 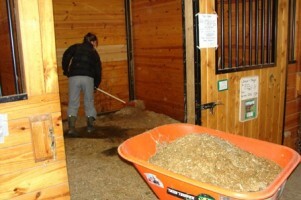 Many horses spend a significant portion of their day in stalls, accumulating large amounts of manure and stall waste. Horse owners generally have a limited amount of time to spend caring for their equine charges; thus, efficient manure removal and disposal is crucial. Additionally, horse facilities are often managed on relatively small acreage, limiting manure storage and application options. The intent of this publication is to educate horse owners on the effective management of horse manure. Horse owners will first gain a thorough understanding of the quantity and characteristics of manure produced by horses. Finally, on-site options for handling, storing and treating manure will be discussed, keeping in mind sound facility management and environmental stewardship. Managing horse manure can be a complex topic, and the principles presented here should be tailored to your specific situation. Please contact your local extension agent or natural resources conservation service field office for technical support. Horses produce large amounts of manure. In fact, if the manure produced from one horse were allowed to pile up in a 12-foot-by-12-foot box stall for one year, it would accumulate to a height of 6 feet. On any given day, the average 1,000-pound horse will produce approximately 50 pounds of manure. This amounts to about 8.5 tons per year. Manure is not the only material being removed when stalls are cleaned. 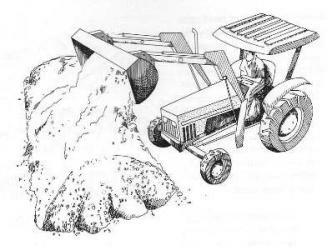 Wet and soiled bedding material must also be removed and can equal almost twice the volume of the manure itself. The amount of bedding material removed will vary by type — shavings, sawdust, straw — but on average, totals between 8 and 15 pounds. Total stall waste produced averages between 60 and 70 pounds per day, which amounts to approximately 12 tons of stall waste per year. When managed properly, horse manure can be a valuable resource. Manure is a source of nutrients for pasture production and can be utilized as part of a pasture management strategy to improve soil quality. The fertilizer value of the 8.5 tons of manure produced annually from a 1,000-pound horse can amount to 102 pounds of nitrogen (N), 43 pounds of phosphorous (P2O5) and 77 pounds of potash (K2O). Nutrient values for manure vary widely. The type and quantity of bedding material included also affects the overall fertilizer value. If a more accurate measure of nutrient content is needed, contact your local cooperative extension office for a list of laboratories that perform manure analysis. Many horse owners do not have enough land or vegetative cover to properly apply large amounts of manure and nutrients. If not managed properly, manure can deposit excess nutrients into the environment via surface runoff or as a leachate, or water-contaminated with manure, from improper manure storage and land application. This can negatively impact water quality and subject landowners to investigation, and in some cases, legal action under an Agricultural Stewardship Act. For these reasons, horse operations are encouraged to use best management practices and develop a nutrient management plan. Nutrient management plans describe the farm’s manure production, soil fertility and recommended manure application and removal rates. For more information on designing a plan specific to your farm’s needs or identifying other conservation resources, contact your local cooperative extension office. Internal parasites, insects, rodents and odors can be manure-related health concerns on horse farms. These issues can be minimized through carefully planned manure storage and handling. Internal parasites may be found in horse manure and can compromise the health and welfare of the horses stabled or grazing the land. Composting manure and properly timed land application can limit the risk of parasite exposure. Insects, especially flies, become a nuisance on farms where stockpiled manure serves as fly larvae habitat. Flies breed when spring temperatures rise above 65-degrees F. Flies deposit their eggs in the top few inches of moist manure, and these eggs can hatch in as little as seven days under optimal temperature and moisture conditions. Therefore, fewer flies will develop if you remove manure from the site or make it undesirable for fly breeding through processes such as composting within a maximum seven-day cycle. Naturally occurring fly predators can also be used to limit the fly population at the manure pile but are no replacement for sound management practices. Rodents can be a problem when manure is stockpiled for extended periods of time, providing them with a warm, safe environment. Additionally, nuisance odor from manure piles can result in strained relationships with neighbors. 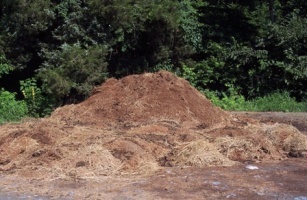 Composting or timely removal of manure piles will help keep odors to a minimum. Finally, keep in mind that large piles of manure are not aesthetically pleasing to your neighbors or those visiting your farm. Keeping the manure storage site screened with vegetation or fencing or by location will help to enhance the beauty of your farm. The average horse produces between 60 and 70 pounds of stall waste per day. Multiply this by several horses, and it is easy to see the importance of having methods in place to manage the manure produced on a daily basis. Letting manure pile up in stalls and paddock areas leads to a host of problems. It is not only unhealthy for your horse — inviting for pests and odors — and aesthetically unpleasing, but the sheer amount of manure produced will overwhelm you. Many handling and storage options exist, but it’s up to you to choose the method that best suits your horse operation. Horse operations with available land may choose to apply stall waste to pastures as fertilizer. This should be done based on soil-test results and nutrient needs. A soil analysis is needed to determine the fertility needs of a pasture. Soil analysis is provided through your land-grant university’s soil testing laboratory for agricultural operations, which include horse farms, free of charge. Contact your local cooperative extension office for instructions on how to take a soil sample. There are also private laboratories that offer soil-testing services. In many situations, manure can be picked directly from the stall, deposited into a manure spreader, applied to the pasture and harrowed into the soil. 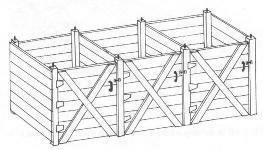 Barns not constructed with a management scheme allowing for stall access by a manure spreader require manure to be carted from the stall to the manure spreader some distance away. In this case, ramps or dropped spreader parking can be helpful to avoid lifting the heavy, cumbersome stall waste. Keep in mind that when spreading manure from stalls bedded with sawdust or shavings, the applied stall waste can stunt plant growth. Wood products contain carbon that soil microbes use for energy but not enough nitrogen to build proteins. The microbes draw nitrogen from the soil to make up for this deficit to such a degree that they can actually limit plant growth. To manage this nitrogen deficiency, nitrogen fertilizer can be applied. Or, to avoid the problem completely, manure can be composted before it is applied to the land. When direct pasture application is not an option, manure storage facilities become a necessity. The storage facility should be convenient to the barn. A general rule of thumb is to plan for 180 days of long-term manure storage. This allows operations the flexibility to store manure when conditions are not ideal for manure application, as when fields are frozen or wet. This storage area should be accessible to the equipment that will ultimately remove the accumulated stall waste. Manure storage facilities should also be downwind and screened from nearby homes to avoid potential complaints about odors and aesthetics. The size, type and location of manure storage facilities will vary by horse operation based on the amount of manure produced, length of time the manure will be stored and available land area. Always be sure to contact your local authorities regarding zoning regulations and additional restrictions. Manure storage should be designed to limit the chance of leachate entering surface and groundwater resources. 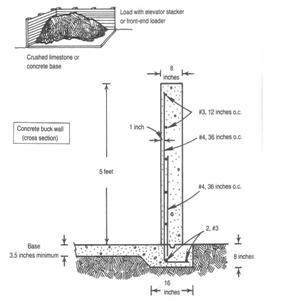 Ideally, storage piles should be placed on gravel, hardened clay or concrete pads that slope inward. The construction of manure storage sites will vary, based on individual situations and soil types. For instance, concrete pads may be necessary in areas with sandy soils where contaminants are more likely to reach groundwater. Storage piles should not be placed in low-lying or flood-prone areas, and care should be taken to direct water from higher elevations away from the site. The natural resources conservation service or local soil and water conservation district offices can provide individualized manure storage design specifications. * Table does not include all scenarios, see resources/references for more in-depth publications on the subject. With careful planning, proper manure management not only protects the environment and increases the efficiency and aesthetics of your farm, but might also save you money while enhancing your pastures. The following resources provide more information on composting and additional facility design specifications. Field Guide to On-Farm Composting and the On-Farm Composting Handbook, available from the Natural Resource, Agriculture, and Engineering Service(NRAES) at www.NRAES.org. Horse Facilities Handbook, available from the MidWest Plan Service at www.mwpshq.org. Check out your local university’s agronomy handbook containing information on soil production, soil sampling, nutrient management, utilization of organic waste and more.